Like the regular Moto X, the Developer Edition features a 4.7-inch 720p AMOLED display, a 2200 mAh battery, a 10-megapixel rear camera, a 2-megapixel secondary camera, and runs Android 4.2.2 Jelly Bean OS. AT&T and T-Mobile versions of the device are also expected to launch, but still aren’t available for purchase at this time. 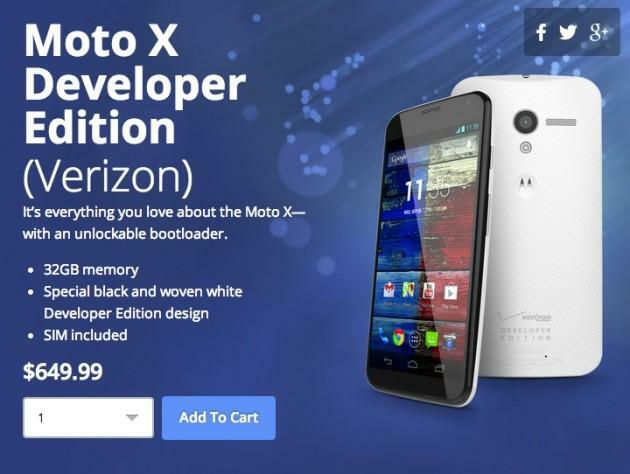 The Moto X Developer Edition is really only meant for power users who want to tinker with their smartphones. For the rest of us, Motorola’s flagship handset is available for the much cheaper price of $199 on-contract. AT&T users also have access to customization tools via the Moto Maker website.